To call Minnesota a hotbed of college hockey would be like calling Kansas City a decent place to get barbeque. Duh! Student Brent Weber works in Husky Productions’ control room on the St. Cloud State campus. This weekend, four college hockey games will air on Fox Sports North, produced entirely by St. Cloud State students. So it’s no small feat that this weekend will mark the biggest lineup of live college hockey productions to air on the Twin Cities’ local RSN. Beginning Friday, five games will air on Fox Sports North with, most notably, four of the games produced entirely by students from St. Cloud State University. 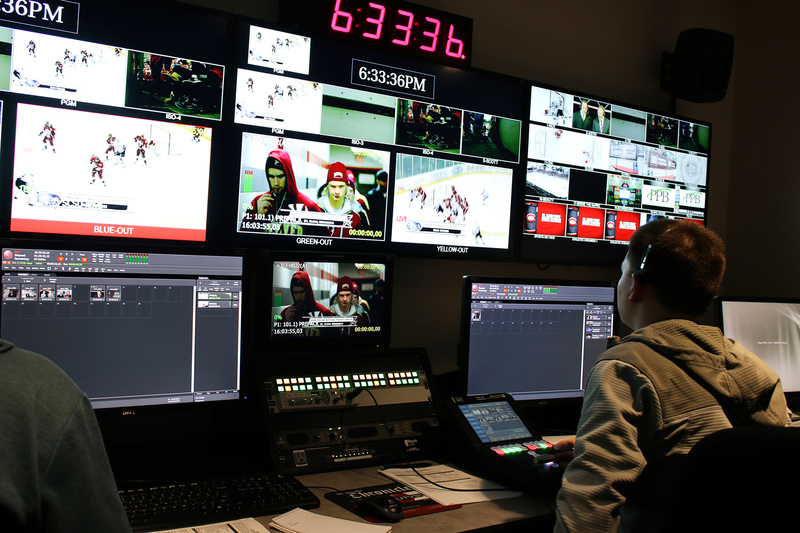 The school’s sports-broadcast division, Husky Productions, is no stranger to producing top-flight broadcasts on the professional stage, regularly finding air time on Fox Sports North for various St. Cloud State athletic events. It has also built quite a record of success, having been honored with nine national awards in the 10-year history of SVG’s annual College Sports Media Awards. St. Cloud State student Chris Person works a live hockey broadcast produced by Husky Productions. Despite all of Husky Productions’ past successes, this weekend represents a never-before-seen effort even for this talented group. Its production of a women’s game against top-ranked Wisconsin will be live on Fox Sports North+ beginning at 3 p.m. CT on Friday. At 6:30 p.m., Husky Productions is back with its pregame show, Husky Face-Off, in advance of the top-ranked St. Cloud State men’s team taking on Omaha at 7:00 p.m. Then, on Saturday, the show moves over to the primary Fox Sports North channel with a 2:00 p.m. women’s game against Wisconsin and a 6 p.m. men’s game against Omaha. 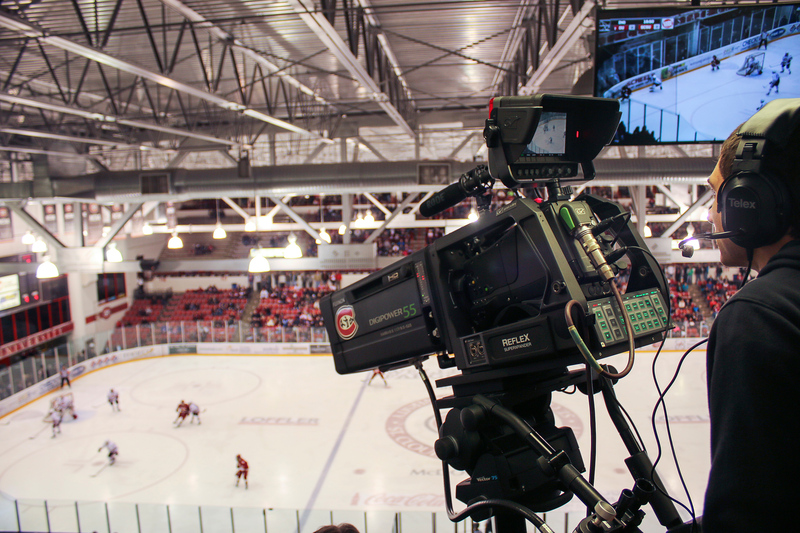 This weekend’s live hockey productions will feature 20 cameras. St. Cloud State student Nick Borzych runs a camera during a game at the Herb Brooks National Hockey Center earlier this year. For the big weekend, Husky Productions is pulling out all the stops technologically to bring its very best shows to Fox Sports North audiences. 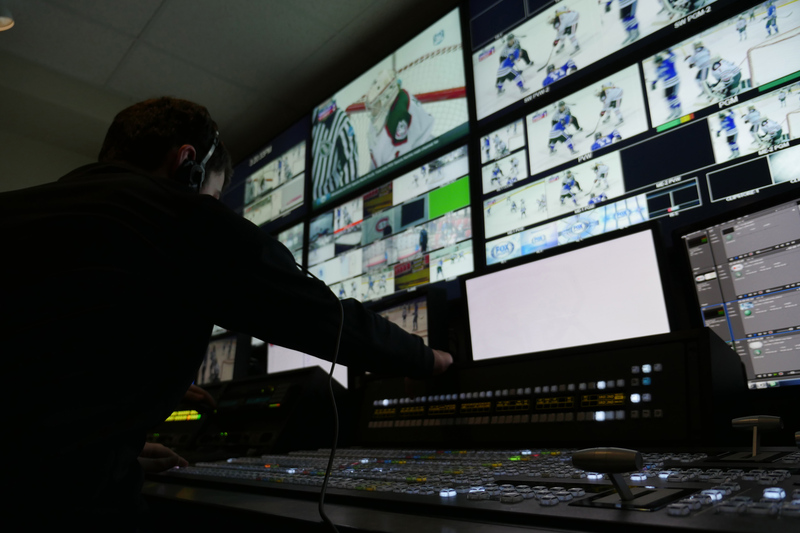 Each game will feature an impressive 20 cameras, including three robotic cameras (Sony BRC-H900’s) mounted on C-mounts that can be controlled by operators across campus in Husky Productions’ control room. According to Derrick Silvestri, a professor at St. 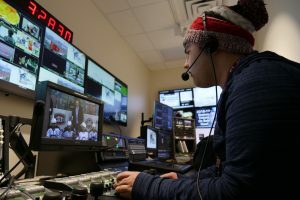 Cloud State and TV studio manager for Husky Productions, the three Sony robos are connected across campus via VLAN. St. Cloud State student Nick Streiff works as a technical director during a Husky hockey game. Other notable tech being used on the broadcast includes eight record and four playout channels on a Grass Valley Dyno production switcher, five Triax/fiber Grass Valley LDX cameras, a variety of PTZ and POV robotics, and lighting supplied by Litepanels. It’s an impressive arsenal at the students’ disposal, a lineup befitting a professional broadcast. “Brian Stanley has done an excellent job getting students prepared for ‘real-world’ TV,” says Tony Tortorici, executive producer, Fox Sports North. In front of the camera, the entire weekend will be anchored at an ice-side FX Design Studio desk by student host Joe Scarrella. Professional Jim Rich and alumna Julie Friend will call the women’s games, and Rich and fellow pro Pat Micheletti will call the men’s games. In-game ice-side reporter Kirsten Krull will work all four games.